Handwara: Fresh firing started between government forces and militants on Thursday at Shatgund, Qalamabad in Handwara area of northKashmir‘s Frontier district. 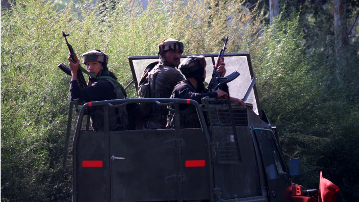 Reports said that the a joint team ofarmyand SOG cordoned off Shatgund Balla area at around 2:30 am. The Joint team later at around 3:00 am fired some warning shots towards the suspected spot but there was no respond from militants. A seniorpoliceofficer said that after searches for 6 hours fresh contact was established between forces and hiding militants. Till this report was filed intermittent exchange of firing was going on. Meanwhile all educational institutions across North Kashmir have been closed for precautionary measures.